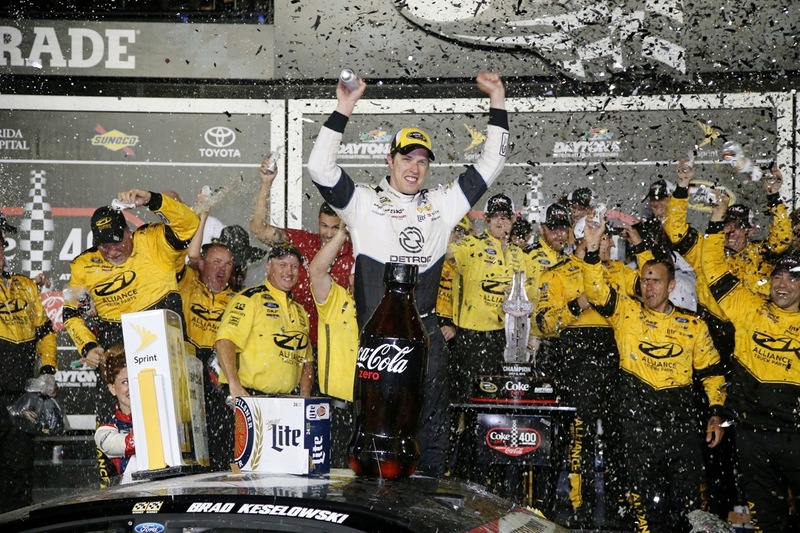 Brad Keselowski, driver of the #2 Detroit Genuine Parts Ford, celebrates in Victory Lane after winning the NASCAR Sprint Cup Series Coke Zero 400 Powered By Coca-Cola at Daytona International Speedway on July 2, 2016 in Daytona Beach, Florida. DAYTONA BEACH FLA- Brad Keselowski accomplished a career first Saturday winning the NASCAR Sprint Cup series Coke Zero 400 for his first Sprint Cup restrictor plate race victory at Daytona International Speedway. It was his first win at the speedway in 15 starts. 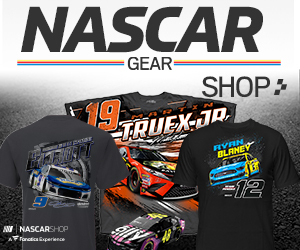 The Penske Racing driver, who had four restrictor plate wins coming into Saturday night but only at Talladega Superspeedway, was the class of the field leading a race high 115 of the 161 laps run. He held off Kurt and Kyle Busch on the final lap and scored his 20th career win in an overtime finish. Keselowski also avoided the carnage that put many of the favorites out of contention and provided on-track fireworks for NASCAR’s 4th of July holiday event. The largest of which involved 22 of the 40 cars entered. The crash erupted on lap 90 as the field entered turn 1. Jamie McMurray got loose and got into Jimmie Johnson near the front of the field. Among the 22 cars swept up in the melee were driver’s Kevin Harvick, Dale Earnhardt Jr., Danica Patrick, Matt Kenseth, Martin Truex Jr., Kasey Kahne, Chase Elliott, and race polesitter Greg Biffle. Most were able to continue but not without extensive repairs. Another favorite also saw his race end in disaster. On lap 148 while running in fifth, Tony Stewart got loose exiting turn 2. Stewart’s Chevy spun down and into the car of Ryan Blaney, with the cars of Casey Mears and Carl Edwards crashing into him. Stewart’s final race ended in the garage and with a 26th place finish. Despite the finish, Stewart took solace in the fact that he was finally able to make it into the top 30 in points, which combined with his win at Sonoma, puts Stewart in position to make this years Chase. The races final caution came out six laps from the finish when AJ Allmendinger and Clint Bowyer got together sending Allmendinger into the wall. Both cars were able to continue, but behind them a chain reaction started as Edwards checked up got into Blaney and ended in the outside wall along the frontstretch collecting Bobby Labonte. The races fifth caution set up a green-white-checkered flag finish. 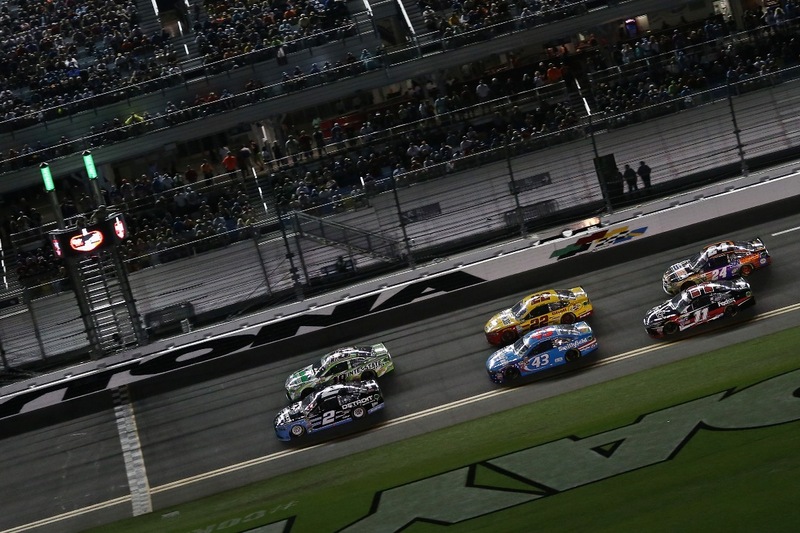 On the restart Keselowski took the lead one final time as Kurt and Kyle Busch dueled behind him. Exiting turn 4, Kurt Busch got together with Joey Logano and was sent spinning into the frontstretch infield. Keselowski crossed the line for the win, Kyle Busch held on for second; Trevor Bayne was third followed by Logano and Ricky Stenhouse Jr. in fifth. Kyle Larson was sixth, Austin Dillon was seventh, Biffle recovered to finish eighth with Bowyer and Michael McDowell rounding out the top 10. The full results can be found here. The NASCAR Sprint Cup series heads to Kentucky Speedway next Saturday night for the Quaker State 400 at 7:30 p.m. with live coverage on the NBC Sports Network.